When I lived in Switzerland, I spent some time working with a company that had nearly 350 employees. That meant that nearly everday it was someone’s birthday, and as per Swiss work culture, that was a cause for celebration. So frequently at 4 PM sharp (in keeping with Swiss punctuality standards), a colleague would inevitably pull out a fancy cake or pastry from a local pâtisserie and a bottle or two of champage to share among our cohort. It’s one of the many fine things I miss about living in Europe. Unfortunately no one in my family has an August birthday, and as August seems lacking in the holiday department as well there’s rarely anything to celebrate for the entire month. But as today marked the 100th anniversary of Julia Child’s birth, I figured that was enough excuse to make a delectable treat. Naturally, I decided to adapt one of Julia’s recipes from Mastering the Art of French Cooking — the Fresh Strawberry Tart. Julia would definitely suggest you make or own pastry shell from scratch, but since I have a big work project due on Friday I cheated and bought a pre-made pie crust from Trader Joe’s. For a tutorial on how to make pie crust from scratch, check out this post. Regardless of the pie crust route you choose to take, bake the empty shell in advance of tart assembly, as per recipe or package instructions. I baked mine at 450*F for about 15 minutes. Set aside to cool. Next, you’ll prepare a crème pâtissière, which is a fancy name for an egg-based custard with booze. In a large mixing bowl, whisk together 1 cup sugar and 5 egg yolks for 2 – 3 minutes. Beat in the flour. Gradually add the boiling milk while continuing to whisk. Transfer to a saucepan set over medium-high heat. Bring to a boil while continuing to stir with a wire whisk. Reduce heat to low, continuing to whisk for another 2 -3 minutes. 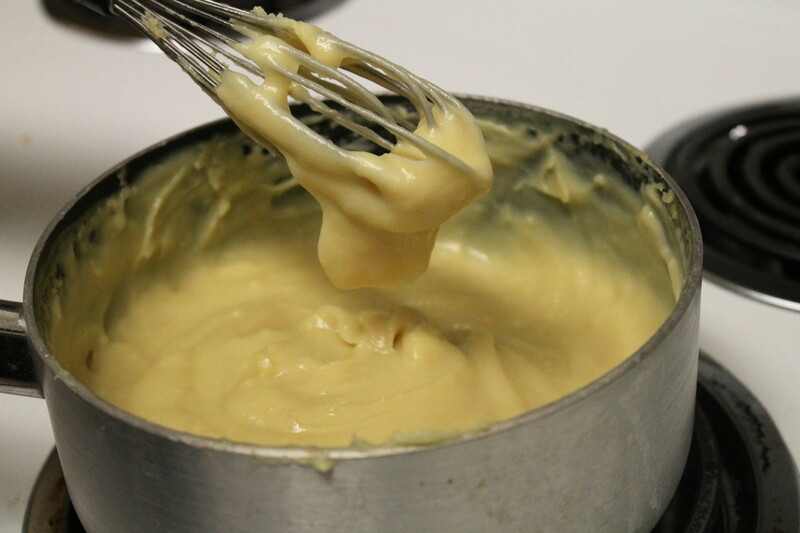 Make sure you scrape the bottom and sides of pan regularly so the custard doesn’t scorch. Refrigerate for at least one hour. 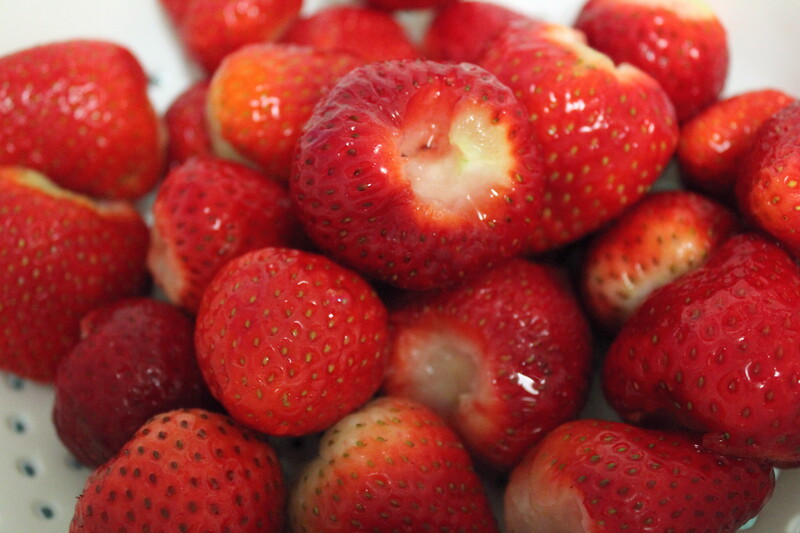 Hull, rinse and halve the strawberries. Set aside. 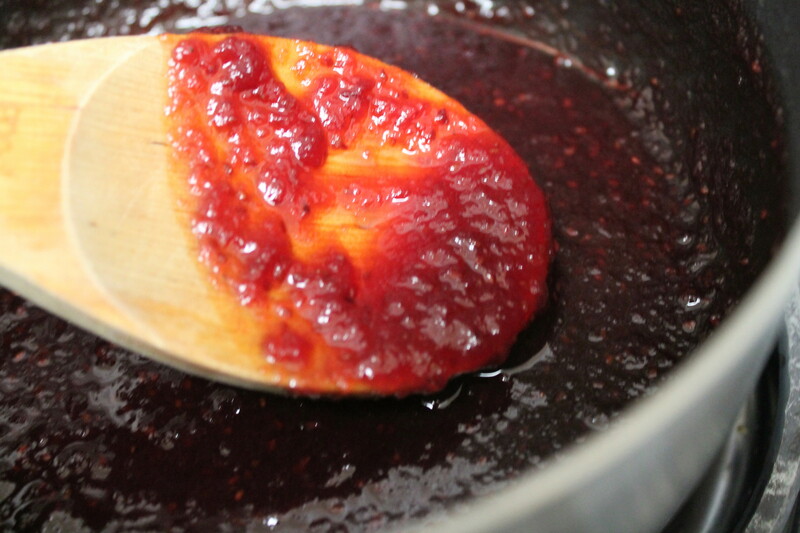 In a small saucepan, combine the raspberry jelly, 2 tablespoons sugar and 2 tablespoons cognac. Bring to a boil and remove from heat. Using about 1/2 of the raspberry mixture and a pastry brush, glaze the top of the pie crust and allow to set for 5 minutes. Pour the crème pâtissière into pie plate, evenly spreading around with a spatula. 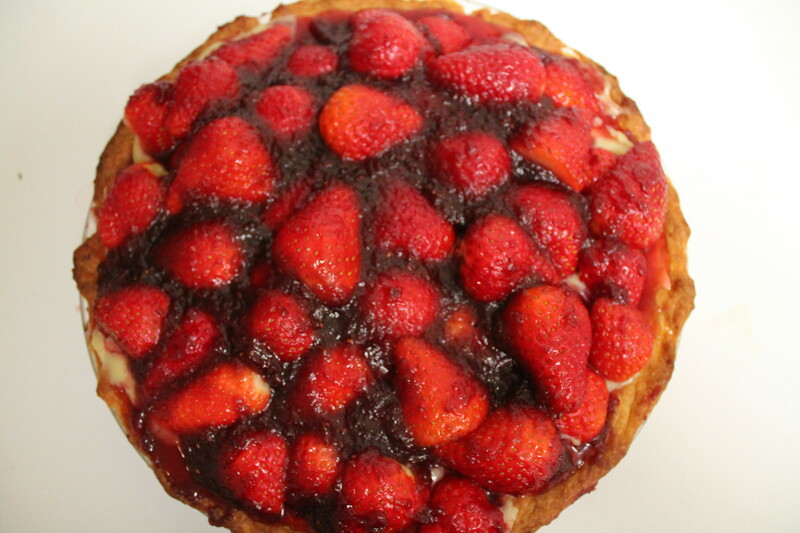 Carefully arrange strawberries on top and glaze with remaining raspberry mixture. 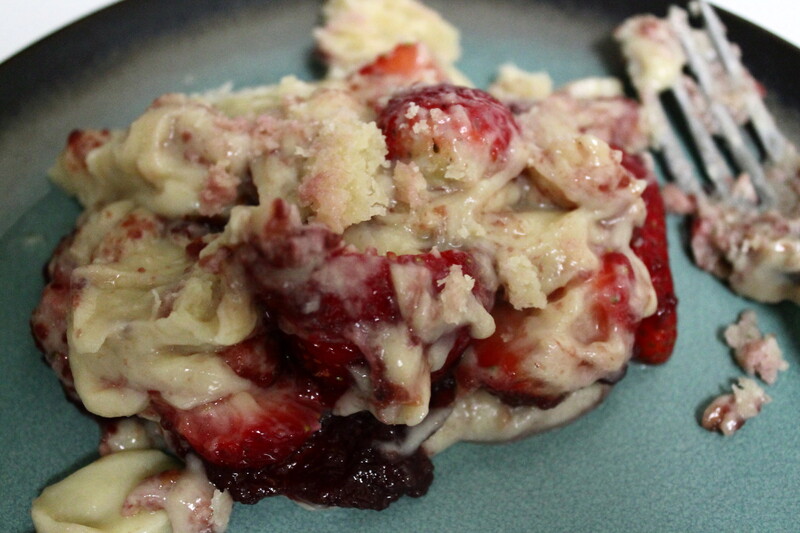 Place in refrigerator at least one hour prior to serving to allow dessert to set. When we served it up, the dessert fell apart a bit, but it was still mighty tasty. I especially loved the boozy custard. This entry was posted in DIY, Recipes and tagged birthday, cognac, dessert, food, French cooking, Julia Child, pastry, recipes. Bookmark the permalink.